the media’s ‘reluctance barrier’. At various times in the 20th century, in various countries, numerous unusual sightings of ‘airships’, rockets etc. were reported, but these did not lead to a sustained public interest and lapsed into oblivion until the records were made public in the years following 1947. The famous ‘Roswell incident’ also occurred in 1947, when a UFO reportedly crashed near Roswell, New Mexico. The United States government stated that a UFO had crashed in the area, later claiming that a ‘mistake’ had been made and the object found was actually a weather balloon. There were unofficial reports of alien bodies being retrieved from the crashed spacecraft, with one alien surviving for a period of time. 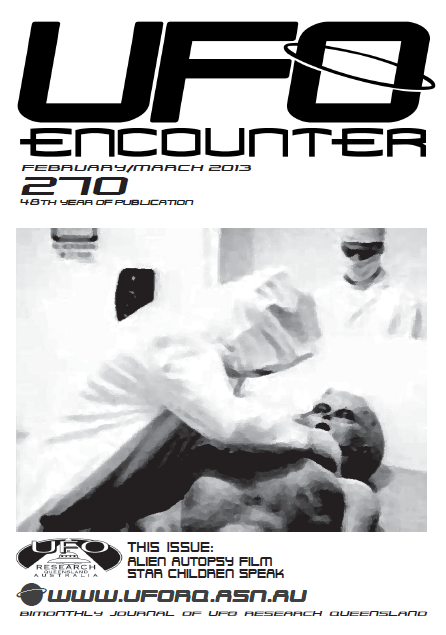 This was to become the most famous and controversial incident in the UFO field today. The incidence of sightings of UFOs is relatively high, being in the range 5 to 7% of the population. So far there has been no indication that particular sections of the population are significantly more or less likely to report such sightings, and it follows therefore that a similar percentage of the scientific and technical community have also had UFO sightings. There are direct statistics tending to support this figure. In the discussion of the significance of UFO sightings reports, the claim is frequently made that only a small percentage, say 5% or less, of all the sightings reported remain unexplained after analysis. This is not our experience, which is that in excess of 75% of reported sightings cannot be explained as something other than a UFO. It is also frequently inferred that many sightings claims are dishonest. Our experience is that the vast majority of reports are honest, and that dishonest reports are relatively easy to recognize during detailed examination of the sighting, because much of the ‘pattern’ of UFOs is not common knowledge, nor is it recognized in UFO literature. can ‘hover’ silently in the air with no apparent means of support, although there is ample evidence (depressions made in soil by landing gear) that they are much heavier than air. When hovering they tend to wobble or gyrate, and when descending slowly, they may perform a ‘falling leaf ’ motion. When departing or arriving UFOs do so at high rates of acceleration, typically 100 times gravity. In flight UFOs can also change direction abruptly, at similar high rates of acceleration. The speeds of UFOs have been measured in various ways, including radar, and these speeds range up to satellite-type speeds in the lower atmosphere. Their flight is typically silent even at hypersonic speeds. The absence of sonic booms is one of the many enigmas these objects present. There is little or no evidence of these objects emitting any matter as part of their method of propulsion, although there are reports of what seems to be dumping of loads of water, soil or other materials. The emissions of UFOs seem to be mainly electromagnetic. At night they are often enveloped in a glow, and sometimes they leave a glowing trail as they move. There is evidence that they also radiate in other bands of the electromagnetic spectrum. Disturbances in the geomagnetic field have been noted at times of UFO sightings, and most ‘UFO detectors’ are based on this. The size of objects reported range from under one metre to ten kilometres, the most frequent size being in the tens of metres. Next to the discoid shape, the elongated or ‘cigar’ shape tends to be frequent with the larger objects, although huge disc shapes have also been seen. Boomerangs, triangles, spheres and ellipsoids have all been reported. The shapes reported generally have no aerodynamic features that would be desirable in motion through the atmosphere. Over the years, a number of individuals have stated publicly that they have met and spoken with the occupants of UFOs and have detailed the nature of these conversations. From these ‘contacts’ we make the statements that within the solar system UFOs usually travel at less than the speed of light, but interstellar travel is performed at the equivalent of many times the speed of light and usually in the larger craft. Widely disparate eyewitnesses have given descriptions of aliens as humanoid in appearance, ranging from three to seven feet tall. 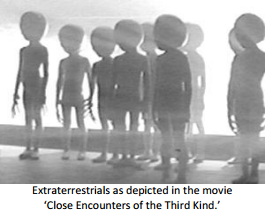 Other reports are of beings with enlarged heads, big eyes and spindly arms similar to those portrayed in the movie ‘Close Encounters of the Third Kind’. Although many different types are reported, these are the most common. 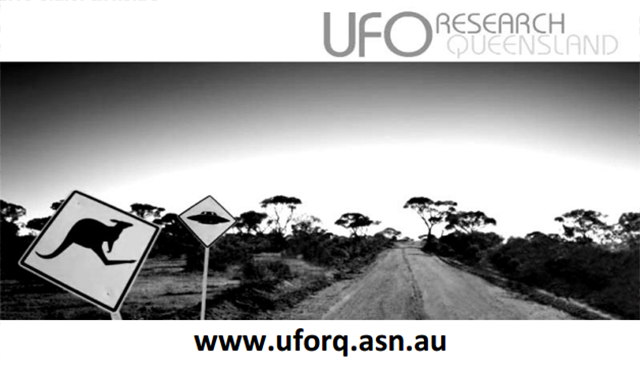 The Australian UFO research community has found that Australia has an amazingly similar record of UFO reports to those of other countries. It is estimated that well over ten thousand sighting reports have been processed in Australia. This represents only a small fraction of the million or so sightings made by Australians over the past half a century. 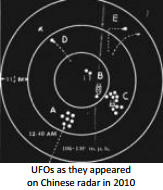 Although there have been many ‘off the record’ reports of sightings by military and aviation personnel, and recorded radar sightings, a very small percentage of these incidents has found its way into the public record. However, there is every indication that were the authorities forthcoming in this respect there would clearly be far better data, particularly as to quantification, photographs and physical evidence, but the essential features of the problem would be the same. In the past The Royal Australian Air Force has had the policy of investigating all well-reported sightings. 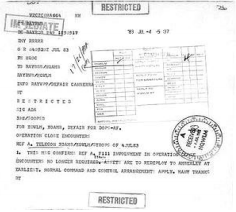 However, Australian civilian UFO groups were advised in January 1994 that the RAAF had reviewed its policy regarding Unusual Aerial Sightings (UAS) and as there was no compelling reason for the RAAF to continue to devote their resources in attempting to explain UAS’s, in future they would not attempt to do so. Members of the public seeking to report UAS’s to the RAAF are now referred to civilian research organisations such as our own. One of the most astounding events in Australian Ufology is the experience of Frederick Valentich, which occurred on the 21st of October 1978. At 6.19pm on this day, Valentich, a young Australian pilot, took off from Moorabbin Airport, Melbourne. He was flying to King Island, just off the coast of Victoria, and his flight was to take him over the Bass Strait. 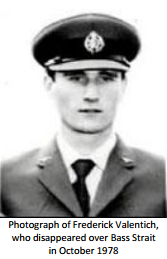 At 7.06pm Valentich radioed Flight Service (FS) with a report of an unidentified craft, metallic, shiny and emitting a green light, lying around his Cessna 182 at unidentifiable speeds. Neither Valentich nor his plane were ever heard from again. The Victorian UFO research group tracked down twenty people at different points around the Bass Strait who were reporting a green light in the same location and in the same time-frame that Valentich was describing his contact. On the 21st of January 1988, the mother and three sons of the Knowles family from Perth were driving towards Mundrabilla when they saw a light ahead of them. As the car got closer to the light, it became obvious that it was hovering above the ground just off the side of the highway. In fact they seemed to be seeing a light that was hovering over another vehicle, and they had to swerve to avoid a collision. Sean, the son that had been driving, made a U-turn and chased the light, which changed its course and headed back towards the Knowles’ own car. Sean turned again but this time the object sped up to the car and landed on its roof with an audible thump. The car was lifted into the air and was dropped back to the ground, bursting one of its tyres. The mother, Faye Knowles, rolled down the window and reached up to touch the object, which felt warm and spongy. Dust surrounded the car and came in through the open window, and there was a foul smell. Once back on the ground Sean stopped the car and the family jumped out and hid in the bushes along the side of the highway until the UFO was gone. 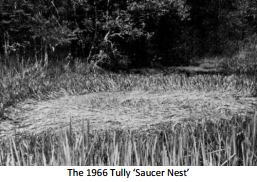 Circles of flattened grasses are perhaps more famous for their appearance in England, but on the 19th of January 1966 one such circle occurred in the swamps of Horseshoe Lagoon at Tully, Queensland. George Pedley, a 27 year old banana grower, was driving a tractor across his neighbour’s (Albert Pennisi’s) property when he heard a hissing noise. He was within 25 yards of the lagoon when he saw a vapour-like, blue-grey object, about twenty feet across, nine feet high and shaped like a saucer - that is of convex shape top and bottom - rise up from the reeds. It spun at a terrific rate as it rose vertically to about sixty feet, then made a shallow dive and rose sharply before taking off at a fantastic speed. Pedley jumped from the tractor and ran across to the lagoon, pushing his way through the six or seven-foot-tall sword grass growing along the water’s edge. He immediately observed, out in the middle of the reeds, a large circular area of slowly rotating water which was completely devoid of reeds. Later that morning he came back past the lagoon and on further inspection saw for the first time the floating mass of reeds, which had obviously come to the surface during his absence. The reeds were radially distributed in a noticeably anti-clockwise manner. In the ‘nest’ as it came to be called, the reeds were quite green as were all the other reeds in the lagoon. Four days later, two sightseers, Tom Warren and Hank Penning, walking around Horseshoe Lagoon, discovered two more ‘nests’. A number of circular ‘nests’ were found within a two month period from February to March 1966. One was four metres across and approximately six others were two to two and a half metres in diameter. From 1966 until 1992 there have been approximately eighty of these ‘nests’ reported to us due to ongoing UFO activity. 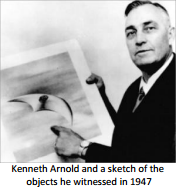 Papua New Guinea was caught in its own UFO ‘flap’ in June of 1959. There were seventy-nine detailed sighting reports from Boianai, Banaira, Giwa, Menapi and Ruaba plain. The most incredible of these occurred at the Boianai Mission starting on the 26th of June and continuing for three days. On the evening of the 26th, Reverend William Gill went out of the mission to look for Venus. He found Venus but also saw a very bright sparkling object above it that seemed to be descending towards the mission. He called two of the mission’s staff, Stephen Moi and Eric Langford, and later others joined them to witness the object. It was described as circular with a wide base and appeared to have an upper deck with something resembling legs beneath it. A blue light was beamed up into the sky periodically and on top of the object four humanoid entities could be seen. The object was reported to have portholes around it and smaller UFOs were seen to be flying in an irregular pattern nearby. The larger object disappeared at 9. 30pm. The following night a similar object was seen with four entities on the top of the saucer. Reverend Gill used a torch to flash a series of lights at the UFO and the UFO seemed to be responding by making a pendulum-like motion, waving backwards and forwards. In total, Gill and thirty-seven other witnesses at the Boiani mission saw the objects in the sky. 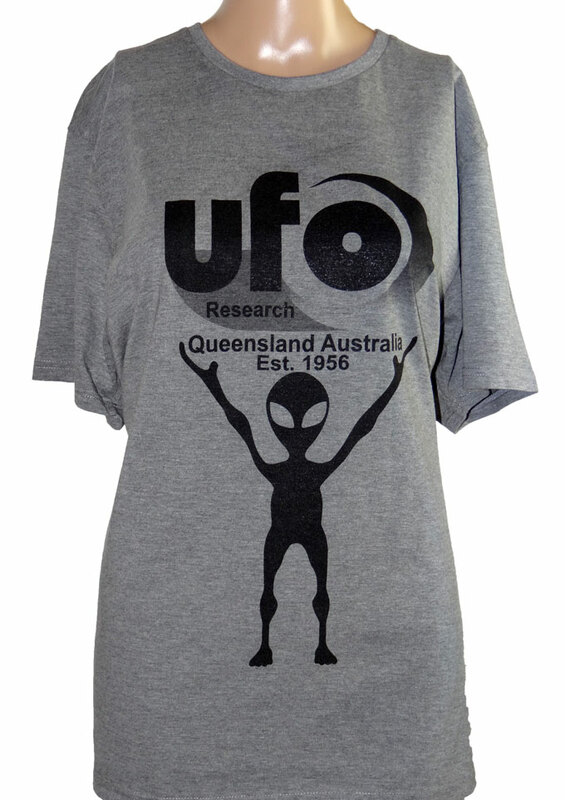 UFO sightings are reported on a daily basis throughout Australia. In Queensland, the most common reports received are of orange lights performing unusual manoeuvres contrary to conventionally known objects that abound in our skies. UFOs have been known to appear over large bodies of water, power stations, military installations and airports, but are also seen over cities and country areas anywhere, anytime. It is long-term and shows no sign of abating. 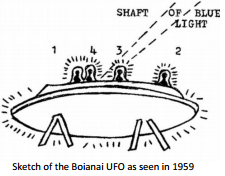 The dynamics of UFOs has remained unchanged. About two hundred million people have seen them. The scientific community has consistently ignored them. Governments have displayed a very high level of reluctance in admitting to any knowledge on this subject. The response of the authorities and trained people generally is remarkably uniform throughout the world, and is every bit as inexplicable as the phenomenon itself. It appears that the policy of most government and military personnel is to deny the existence of UFOs. There has been an all-out effort by these powers to belittle the reports made by the public, and in so doing has created an unhealthy and unbalanced view of the phenomenon. There is an obvious ‘cover-up’ of the UFO phenomenon in place, and this has contributed to the confusion that reigns in this field today. The UFO database is founded on the evidence of many thousands of people from all walks of life, who recognize that here is something so important that they are willing to face ridicule, rejection and even danger to tell us about it. Their courage has given them a place in history, and the future belongs to those who are willing to stand with them.